election results | What Did You Say? 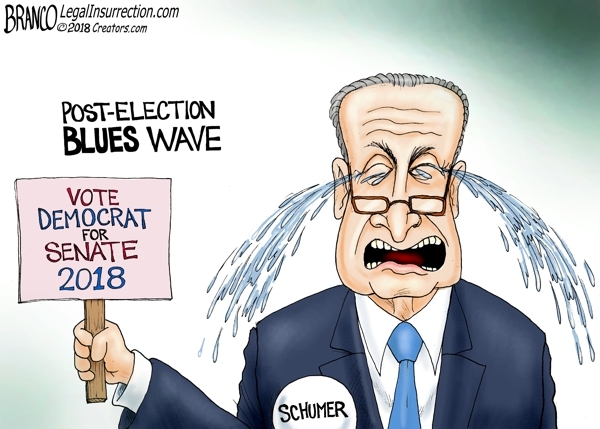 The 2018 election did not reveal the long-anticipated “Blue Wave” but it did reveal a Blues Wave by “Cyin’ Chuck Schumer in the Senate. Former Republican Governor Rick Scott takes a narrow victory over incumbent Democratic Senator Bill Nelson. Democrat Elaine Luria of Virginia elected to the U.S. House, defeating Republican incumbent Scott Taylor. Democratic Rep. Tim Walz elected Minnesota governor, defeating Republican Jeff Johnson and keeping party’s hold on seat. Democrat Andrew Gillum has conceded defeat in the Florida gubernatorial race to Republican Ron DeSantis. Democratic Sen. Martin Heinrich has been re-elected in a three-way race against Republican political newcomer Mick Rich and Libertarian former governor Gary Johnson. Democrat Sean Casten defeats Rep. Peter Roskam to flip suburban Chicago district GOP has held for decades. Republican Gov. Pete Ricketts of Nebraska wins re-election, defeating Democrat Bob Krist. Democrat Rep. Jared Polis of Colorado elected governor, defeating Republican Walker Stapleton. First-time Democratic candidate Jason Crow defeats 5-term Republican U.S. Rep. Mike Coffman in suburban Denver district. Democrat Debbie Mucarsel-Powell ousts Republican Rep. Carlos Curbelo from U.S. House seat in Florida race. Democratic Sen. Amy Klobuchar of Minnesota wins third term, defeating Republican Jim Newberger. Democrat Bob Casey of Pennsylvania wins third Senate term, beating Republican Rep. Lou Barletta. GOP Gov. Greg Abbott of Texas, Democratic Gov. Andrew Cuomo of New York win; Wyoming’s gubernatorial seat goes to Republican Mark Gordon. Republican John Barrasso of Wyoming and Democrat Kirsten Gillibrand of New York re-elected to the Senate. Democratic Sen. Bob Menendez of New Jersey re-elected to third term, defeating Republican Bob Hugin. Former Clinton administration Cabinet member Donna Shalala of Florida elected to U.S. House, defeating television journalist Maria Elvira Salazar. Democrat Jennifer Wexton of Virginia elected to U.S. House, defeating Republican incumbent Barbara Comstock. Democrat Sherrod Brown re-elected to Senate in Ohio, defeating Republican Jim Renacci. Virginia U.S. Sen. Tim Caine has won re-election in Virginia, defeating Corey Stewart. Vermont’s Bernie Sanders has cruised to re-election for his third term in the Senate, easily outpacing eight candidates. Sanders, the independent who has long been one of the state’s most popular politicians, spent little time campaigning ahead of Tuesday’s election.